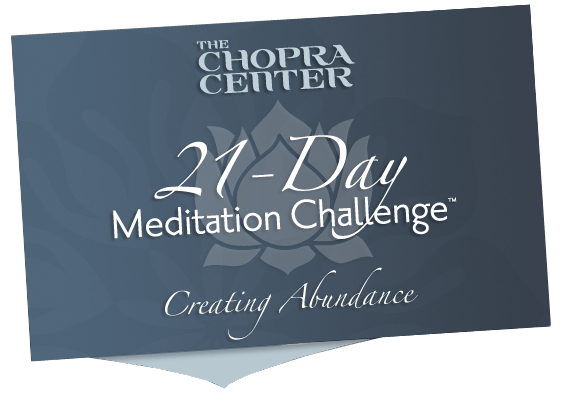 These last few weeks I have been participating in Deepak Chopra’ s 21-Day Meditation Challenge in an effort to maintain a daily meditation practice. I meditate almost everyday but I am really trying to make it a daily ritual. I am happy to announce it is working quite well for me. Deepak is focusing on Abundance in this particular meditation challenge and this topic really got me thinking. Through my spirituality practice I have found that having an abundant mentality is essential for manifesting all the things we can possibly want in our lives. I came to realize that when we worry and stress is because we are consciously or subconsciously experiencing lack. We worry about not getting the career that we want, we stress about paying bills, finding love, and the list goes on and on. We tend to highlight on what we are lacking. We can lose confidence due to feeling of not being enough, we may not follow our dreams because we feel that we can never make enough money doing what we love, or we may settle for a lover who is not fulfilling us because we think he/she is all we are worth. Worrying and stressing is focusing on how little of something we have. We find a corner of our lives where something is deficient and for some crazy reason we pick that corner to live in. We dwell on all the ways we can’t do something without arguing a case on why we can do it. On the flip side, an abundant mentality enables us to pull from our infinite source of abundance. We can illuminate any dark deficient corner with this mentality. From this source we can always take without a fear of running out. I silently tell myself that at any given moment I am being provided for and that I have everything I need. I tell myself that things will present themselves in my life when I need them and the Universe will negotiate the timing on my behalf. I open my eyes and instantly, I feel better! It only took less than a minute. It is like a mini meditation. Every single one of us has this limitless abundant source where possibilities are endless. It is our responsibility to tap into our abundance and receive. Try this out next time you find yourself stressing. Get whatever you need from you infinite source and let me know how it is working out for you. I would also like to hear how you deal with stress and worry in the comments below. I read your blog yesterday on herfuture and I must say that I have been using your advice about envisioning a well to gather what we are lacking, and of course it has been a day, but it seems to be calming me somewhat some bit. I would love to read how you and others perform your daily spiritual “rituals”, I have been trying to come up with one for me but thus far it has been more of a now or never sorta plan. Thank you for your blog, I look forward to hearing more. Hello Bee! I am glad that it is working for you! I will write a blog about daily rituals. Like you I am in the process of creating something that works for me. Let me know how your doing with yours. When we finally go through the concept of the expression appreciate, not only in relation to an enchanting connection by using a different, however , as being a feeling that could be engendered if you have miltchmonkey a better connection on your own too – or simply as the a sense greater oneness with your family as well as human race : the idea results in being a lot more extraordinary that all any one is looking for in life is usually enjoy.